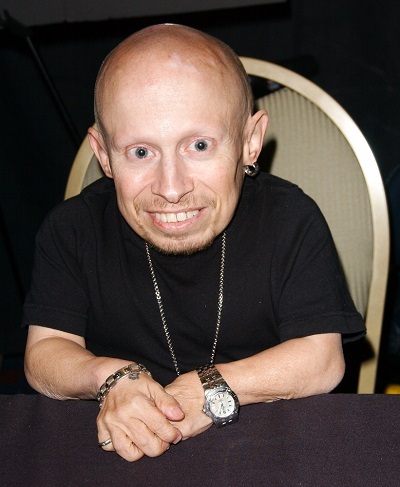 Place of Birth: Sturgis, Michigan, U.S.
Verne Troyer was an American actor, stunt performer, and comedian. While both sides of his family have lived in the United States since the 1700s, he was still of entirely German descent (including some Swiss-German). His family has an Amish background. Verne’s patrilineal line can be traced back to Nicholas Troyer, who was born, c. 1550, in Switzerland. The Troyer family lived in Trub Valley, Emmental, Canton of Bern, Switzerland. Verne’s paternal grandfather was Reuben J. Troyer (the son of John Harrison Troyer and Susanna Yutzy). Reuben was born in Oklahoma. John was the son of Jeremiah J. Troyer and Veronica/Fannie J. Bontrager. Susanna was the daughter of Jonas R. Yutzy and Mary Miller. Verne’s paternal grandmother was Mattie M. Miller (the daughter of Moses P. Miller and Susanna/Susanne C. Miller). Mattie was born in Kansas. Moses was the son of Christian C. Miller and Polly Plank. Susanna was the daughter of Christian F. Miller and Magdalena/Mattie J. Hochstedler/Hostetler. Verne’s maternal grandfather was Verne/Vern Edward Yoder (the son of Joseph J./G. Yoder and Susanna B. “Susie” Hochstetler). Verne’s grandfather Verne was born in Michigan. Joseph was the son of Joseph S. Yoder and Mary Borkholder/Burkholder. Susanna was the daughter of Benjamin E. Hochstedler/Hochstetler and Mary Elizabeth Kline. Verne’s maternal grandmother was Miriam/Merriam J./S. Bontrager (the daughter of John M. Bontrager and Elizabeth B. Mullet). Miriam was born in Kansas. John was the son of Manasses E. Bontrager and Veronica/Fannie Miller. Elizabeth was the daughter of Benedict B. Mullet and Miriam S. Hershberger. Amish is more of a religious affiliation than an ethnicity. They still call themselves Deutsch and they speak German unlike other descendants of German immigrants in US. I’d say Amish is an ethnoreligious group, like Jews. Some jews will tell you that Judaism is only a religion and has nothing to do with ethnicity. Yet, they match the definition of an ethnic group (shared culture, language, history etc), like the Amish do. But do Amish people self identify as being of Amish ethnicity like most Jews do? I do not know how the Amish defines themselves, but I find it hard to believe that their distinct lifestyle and culture gives them no sense of identity. I do not see a problem with it having a religious affiliation if it is unique to a specific and distinct group, like the Amish or the Jews. Amish still continue to refer to themselves as Deutsch ethnically. We don’t make a distinction between for instance Muslim Albanian and Christian Albanian, so why make a distinction between Anabaptist German and Catholic German. I read he’s playing Heinrich Himmler in a comedy film in 2017…it can’t be true.